Zahra and Yusuf Buhari , children of the current president, have been spotted campaigning for their father and his running mate Osinbajo in Abuja. The siblings who became famous after their father resumed office in 2015 have been trying their hardest to stay away from the public eye as they have found it often unfriendly. Recall Zahra who is married to billionaire businessman's son, Ahmed Indimi was said to have welcomed a child but has managed to keep the details and photos off social media. Yusuf had a lot of Nigerians worried when he was reported to have been involved in a bike accident sometime in 2017. However, elections are close and the family of the president have chosen to join some Nigerians to campaign for their father despite rumours of the family staying away from the campaigns. 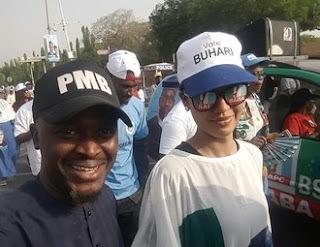 The following photos prove that Zahra and her brother, Yusuf are in full support of their father and his running mate, Osinbajo as they seek re-election in February 2019. The siblings can both be seen rocking APC's shirt, hats and sunglasses as they walked the streets of Abuja in support of the Buhari/ Osinbajo re-election bid. Meanwhile, Zahra had nothing but heart-warming words for her dad when he clocked 76 . The happy daughter wrote from her soul when she wished him well on the occasion of his birthday.